The second experiment in my exploration of selling handspun yarn came in the form of two Spunky Eclectic tops I'd been eyeing for a while, and was inspired by my friend Caro, the Queen of the Three Ply. 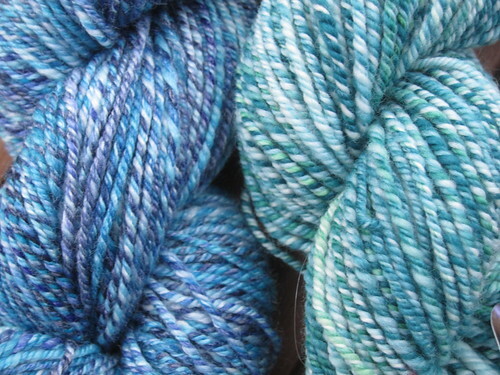 Fiber: on the left, SE Panda (60% superwash merino/30% bamboo/10% nylon) in "Blue Moon", on the right, SE superwash merino in "Emerald Isle", both purchased on my first visit to Amy's bricks and mortar store in August of 2009. 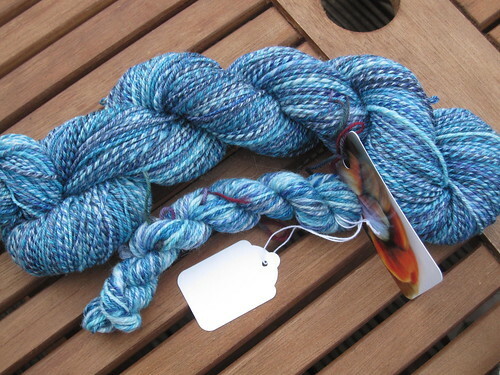 Spun/plied: 15:1/12:1 and 15:1/15:1 respectively, both spun worsted, with a short forward draw. I prepped each top by splitting it into three equal lengths, and then stripping each piece into 6 sections. 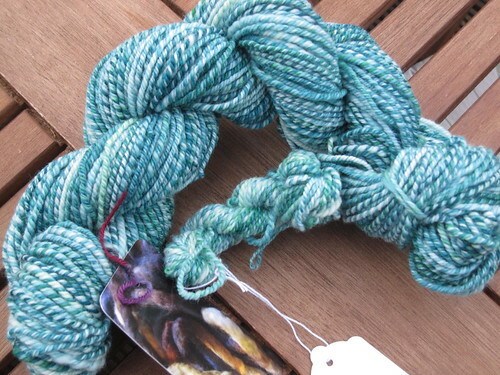 I spun each length on to one bobbin and then 3-plied. Stats: 241 yds and 144 yds respectively (might have to double check that second measurement). Approximately DK weight on both. Now for the experiment part. I spun up the Panda willy nilly, and loved every minute of it. The finished yarn is smooth and drapey and I desparately want more so I can make a tank top out of this stuff. The bamboo gives it a lovely shine. 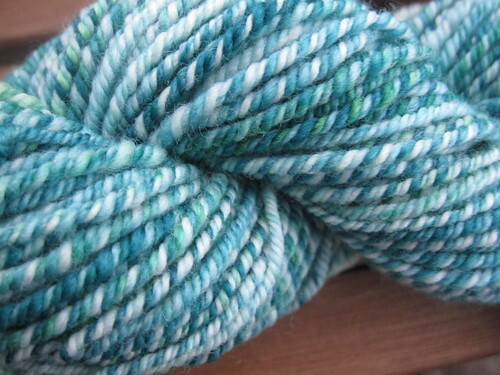 When I pulled out the other superwash merino, I decided to keep track of how long it took me to spin it up. 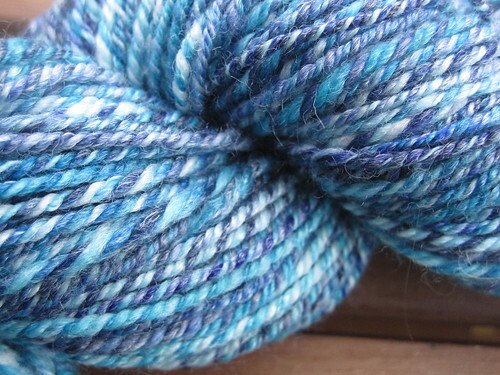 Written by porpoise On August 19, 2011 In "handspun", "spinning", "stash"